The 6-3 vote of the Debt Affordability Advisory Committee approved a study that for the first time calculated unfunded liabilities in the State Health Plan and state pension system into debt capacity. Voting no were state Budget Director Charles Perusse, Revenue Director Ronald Penny, and Auditor Beth Wood. The study left less room to borrow money for construction and maintenance of K-12, university, and state government buildings, and for local government water and sewer infrastructure improvements some committee members advocated. But backers of the study noted bond agencies and large financial institutions have urged governments to include unfunded liabilities in their debt calculations. Lenders are likely to look more favorably on states that have done so when they ask to borrow money. The governor and General Assembly use the debt affordability study as an important tool in drafting budgets and considering program and project priorities. By law it had to be sent to the governor by Feb. 1. 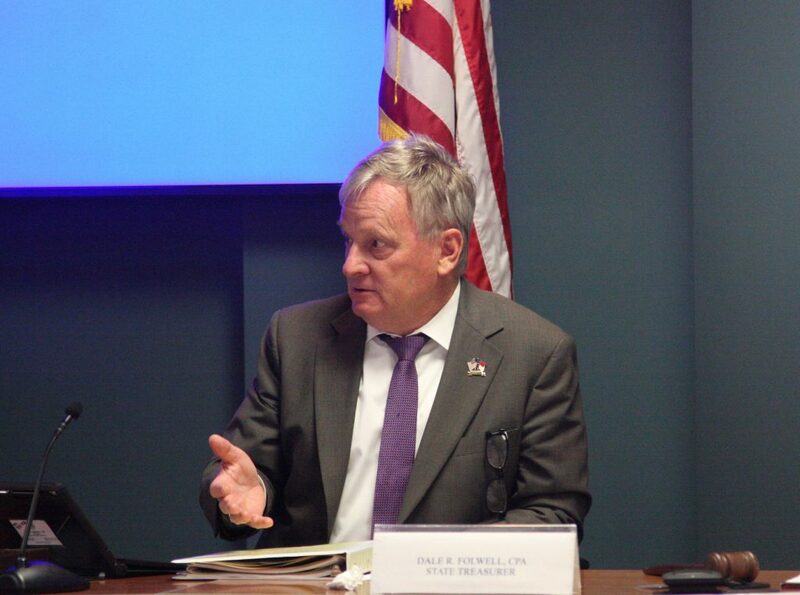 “Our business is to calculate mathematically what the debt capacity of the state is so that we have a solvent state that can weather anything that might come in front of us,” State Treasurer Dale Folwell, committee chairman, told Carolina Journal after the meeting. He told committee members the Treasurer’s Office pays $740 million every 30 days for pension, health care, and outstanding debt. Gross annual payout of $6 billion will quickly reach $9 billion. Folwell said he discussed the debt study with past treasurers. He’s confident the recommendation aligns with principles they espoused since the Debt Affordability Advisory Committee was created 15 years ago. Deputy Treasurer Greg Gaskins said national bond rating agencies are scrutinizing states’ pension and other employee and retiree benefits more closely to see how well they’re funded. They have directed states to include unfunded liabilities in debt affordability reports. North Carolina will have a better chance to sell bonds in a competitive market if it follows rating agencies’ directions, Gaskins said. That also will help protect North Carolina’s AAA bond rating among the three major rating agencies. That rating can secure lower interest payments and a bigger bang for borrowed money. Business coalitions and bond buyers also are beginning to pay closer attention to states’ unfunded liabilities for creditworthiness, Gaskins said. Perusse said the law doesn’t require the debt affordability study to include unfunded pension or health plan liabilities. He said under the previous formula, debt capacity for the next 10 years would be closer to $10 billion. He advocated a borrowing ceiling of $6 billion or higher. It is important to acknowledge the unfunded liabilities in the debt study, Perusse said. But the report gives them too much weight, and chokes off the ability to reduce more than $30 billion in unmet needs. Forty percent of school buildings are more than 50 years old, and $8 billion is needed for construction and repair, Perusse said. There are $17 billion in water and sewer needs, and $6 billion necessary for state government and university buildings. Penny said lowering employee and retiree unfunded liabilities is important, but not as critical as school needs. He said strong schools are the catalyst to improve rural economic development. Wood said “it pisses me off” that so many cities, counties, and school boards failed for years in their responsibilities to pay for local construction and infrastructure projects. That puts her in the untenable position of choosing between their pressing needs, and the urgency of addressing unfunded pension and health plan liabilities. She said the state allowed local governments to shirk accountability for too long, but she voted against the debt study because it turns a blind eye to those local needs. In voting for the study, State Controller Linda Combs agreed local governments have enormous needs due to their own failings, and committee members all would like to see them resolved. But for several years the state has vowed to tackle unfunded liabilities, and it’s vital for the fiscal integrity of the state to follow through. Folwell said he stands behind the debt affordability study, but the General Assembly and governor have no obligation to follow its recommendations. They can borrow higher amounts than recommended, but should be prepared to own any consequences.